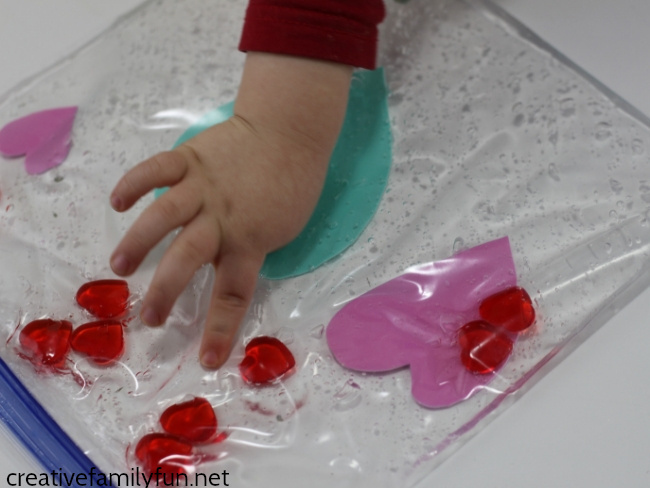 Are you looking for a mess free Valentine’s Day activity for young children? 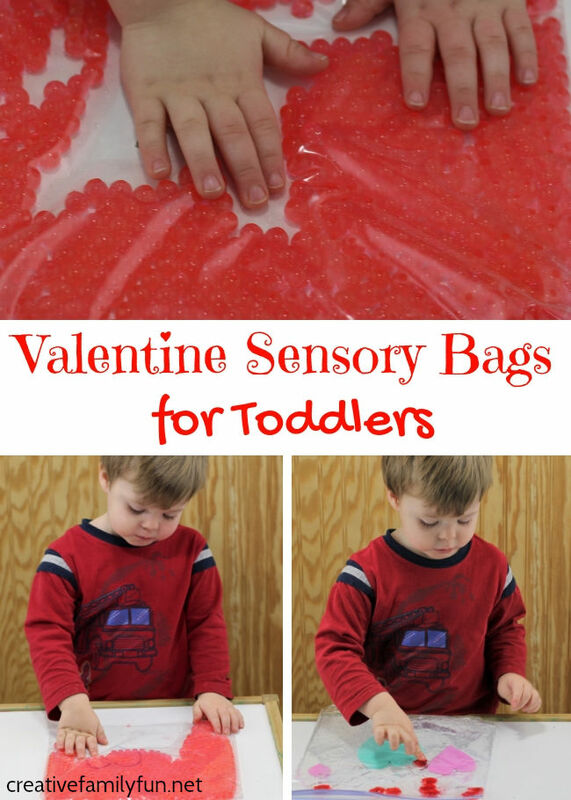 You’ll want to check out our Valentine sensory bags for toddlers. They are super easy to put together and my kids just love to play with them. Select a zip top plastic bag. I used a gallon size freezer bag but a quart size bag can work, too. Use rubbing alcohol and a paper towel to remove any labels from your bag. Follow package directions to hydrate your water beads. (It might take a couple hours.) 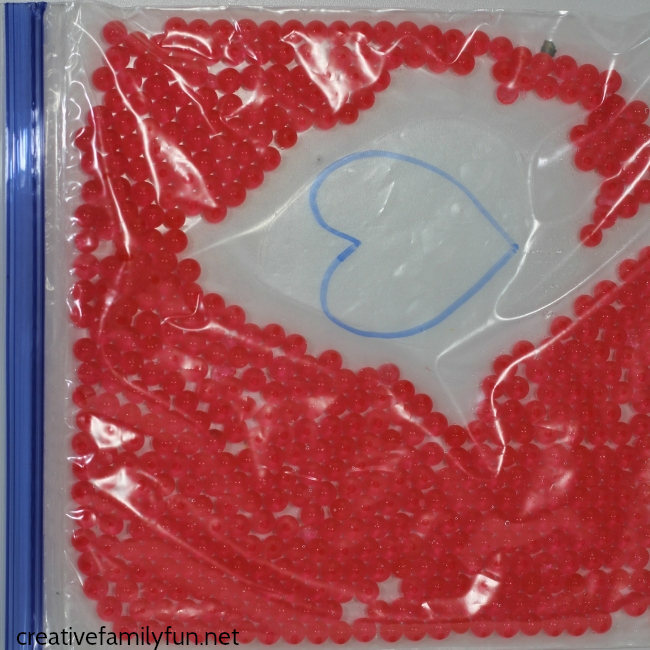 Add the hydrated water beads to your zip top plastic bag. I found my water beads in the craft section of Walmart. Amazon sells water beads for a good price as well. You can find some water beads already hydrated like the Orbeez brand at several retailers or online. 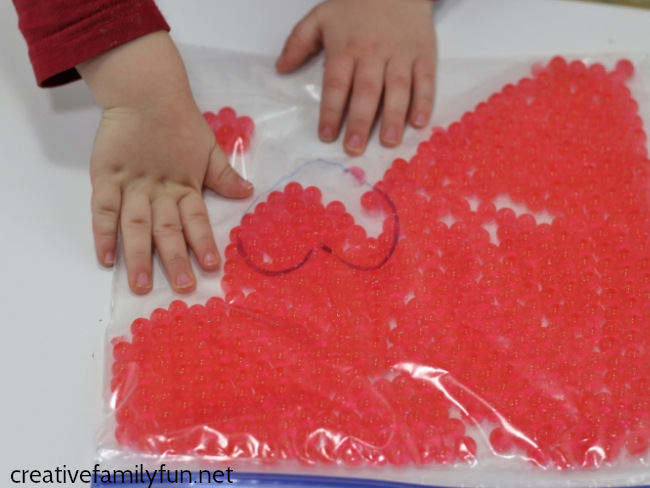 You can add extra water to your plastic bag or just the water beads. Adding water will change the sensory feeling just a little bit. I drew a heart on the plastic bag for an added valentine element. Encourage your child to push the water beads into the heart or away from the heart. This focuses on fine motor control. Here’s a great opportunity to practice counting. 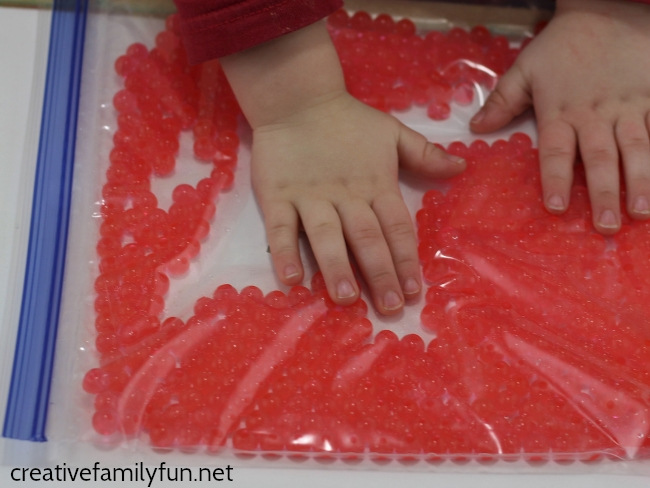 How many water beads will fit inside the heart? You can tape the plastic bag shut if you’re worried your child might try to open it. Taping the bag shut may also help keep the bag from popping open when your child pushes on it. I like to use the freezer bags because they are a bit more sturdy and their zippers tend to be stronger. If the bag moves around on the table while your child is playing, tape it down. Instead of filling the sensory bag with water, you can use hair gel. I found a bottle of clear hair gel at Dollar Tree. Using hair gel changes the way the sensory bag feels. It’s more squishy than water. Water will work for this sensory bag, too. Just be careful how full you fill the bag. It may pop open if your child pushes too hard. Feel free to use tape to seal the top of this bag as well (especially if you’re using water instead of hair gel). 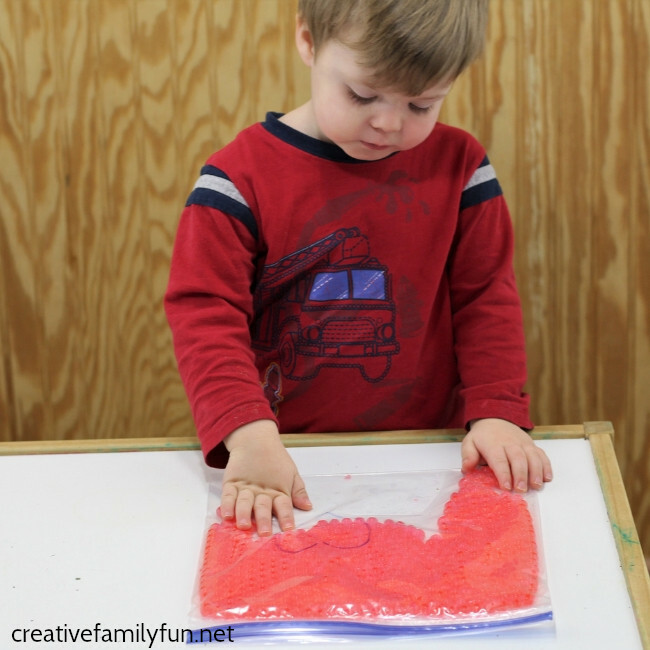 You can also tape this sensory bag to the table to prevent it from sliding around while your child plays. Use rubbing alcohol and a paper towel to remove any labels from your zip top plastic bag. Add the bottle of gel to your bag. Cut out foam hearts and place them in your plastic bag. Add plastic hearts to the bag. I found our plastic hearts at Dollar Tree. Encourage your child to push the plastic hearts around. I started with the plastic hearts on top of the foam hearts. My toddler immediately pushed them all off. Then, I asked him to push the red hearts back on top of the foam hearts. Practice counting the hearts. How many red hearts are on the blue heart? 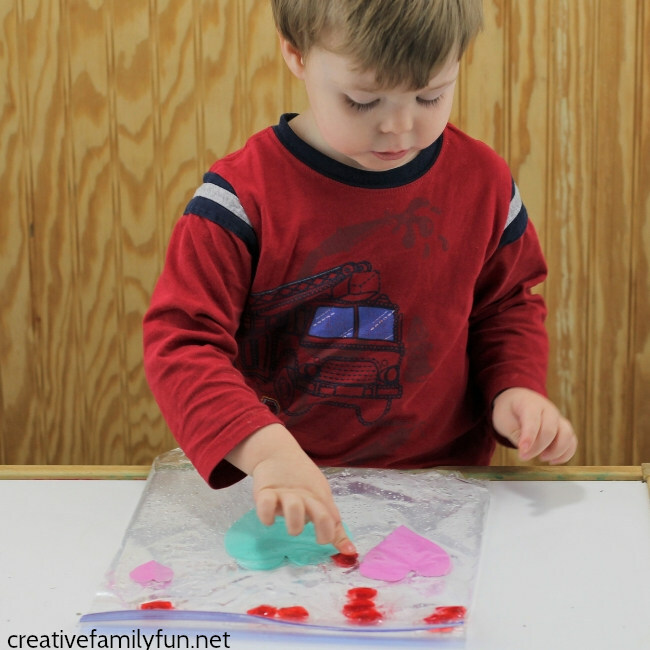 Valentine Crafts for Toddlers – Check out this collection of easy craft ideas for little ones. Frozen Vinegar Hearts – Combines two ingredients kids love: baking soda and vinegar. 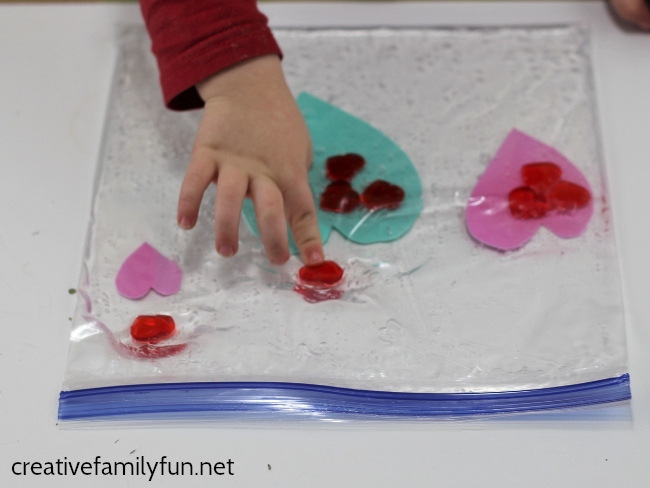 Add some frozen hearts and you have a perfect Valentine’s Day science activity. Guess How Much I Love You Movement Game – Have fun moving around and doing the actions from the book with this fun game. Do more with your toddlers! It’s so beneficial to have fun activities to do with your toddler. My friend Jamie from Hands On As We Grow has got a great free 7-Day Toddler Activity Challenge. You’ll have fun and make memories with these age-appropriate and simple activities. They’re the best! You can follow this link to sign up for the FREE 7-Day Toddler Challenge. What do you do when it’s too cold to go and play in the snow outside? You bring a little inside! 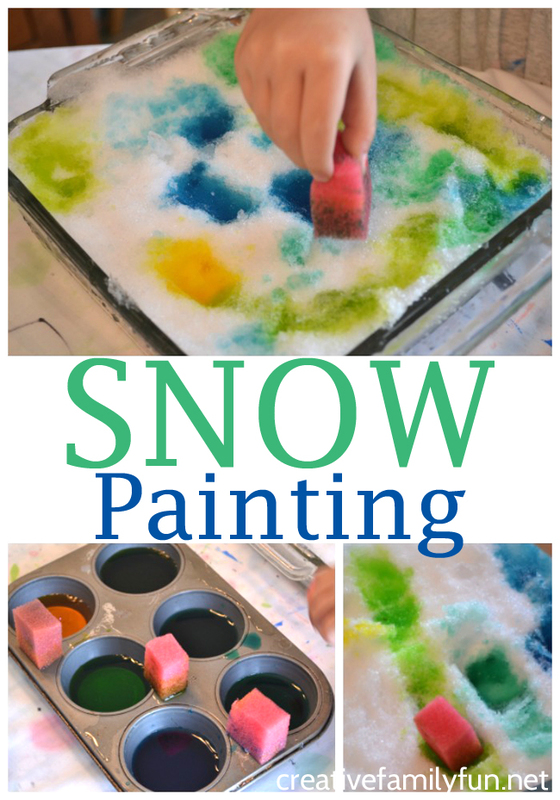 When I originally planned this snow painting art activity, we were going to suit up in the winter gear and do some fun outdoor art. But thanks to the recent polar vortex (Brrrrr…) and wind chills hovering around -50 degrees F, I was forced to scrap my original plans. That’s when it hit me, we should bring some of the snow indoors! 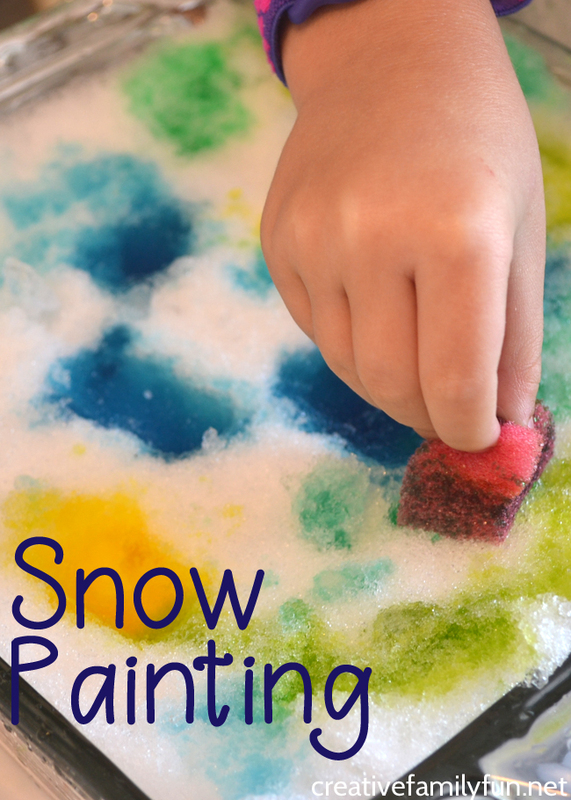 We created a simple DIY snow paint and got ready to create. It was fun and a great way to spend a cold and snowy day! Are you ready to do some snow painting? I mixed up a few colors of paint before I braved the cold to fetch our snow. The paint is simple. To make it, I filled the cups of a muffin tin about 2/3rd’s full of water. I then added about 3 – 4 drops of food coloring in each. We went with shades of blue and green only because I was completely out of red food coloring. I cut up a sponge into small pieces to use instead of a paint brush. After freezing my rear off fetching snow, I filled up two square baking pans. We patted the snow down and tried to make it level. These were our painting canvases. The girls were eager to get started. The took the sponges and started painting. And start they did. One painted stripes, the other opted for a more random design. They giggled and they squeezed their sponges. 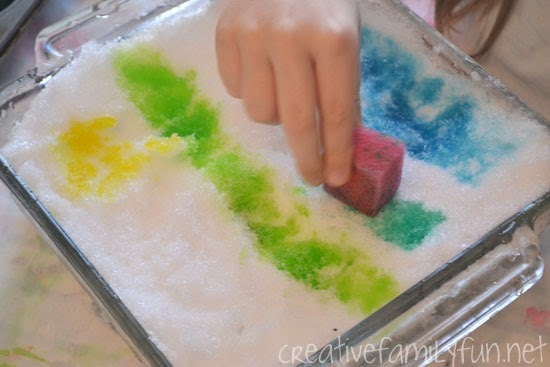 Then, they experimented to see what would happen if they pressed down hard or if they left their sponge sitting on the snow for awhile. My girls used up every single drop of paint by the time they were done and we were left with some snow masterpieces. Unfortunately, these masterpieces don’t last very long. It’s a good thing I was taking pictures! Have you ever tried snow painting? Have you heard about the online Art Spark workshop hosted by Cathy James at NurtureStore? It’s so good! Cathy will guide you and your children through a month of art projects that are easy, fun, and hands-on. She’ll introduce your kids to famous artists and art works, and even weave in lessons about science, character, and confidence. The workshop includes two bonus ebooks full of inspiration and practical tips, so you are fully supported and all set to get creative! 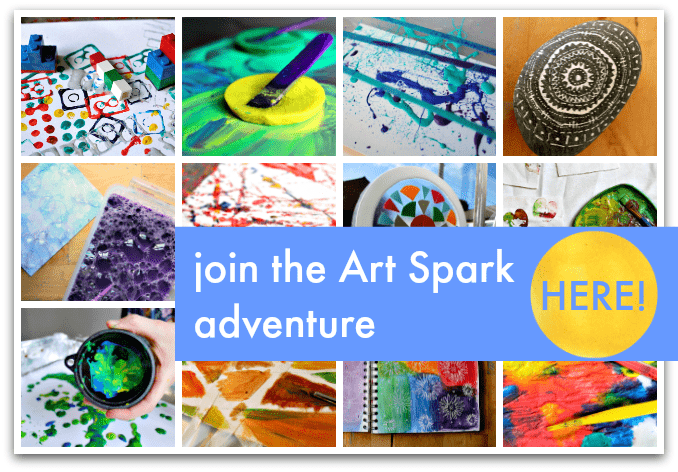 Join the Art Spark workshop here. Are you looking for more kids activities? I’ve always loved learning with arts and crafts and so have my girls. We’ve made so many fun craft projects over the years. 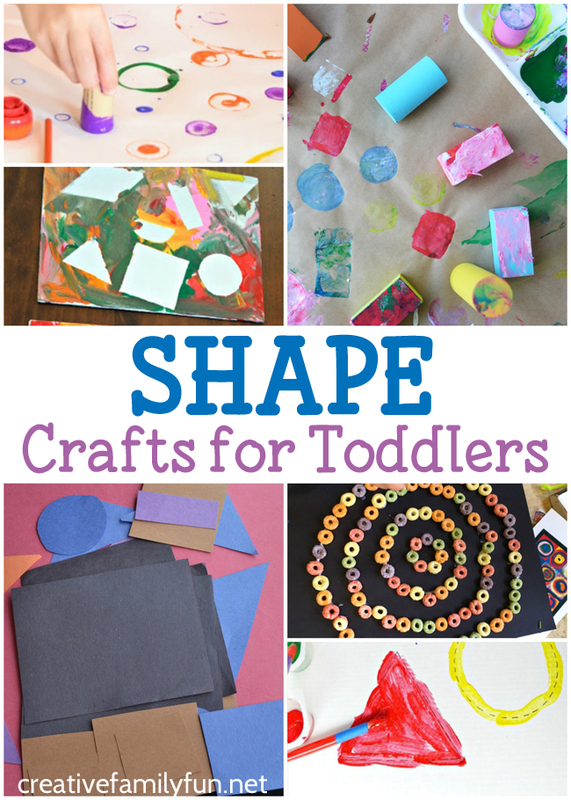 These fun shape crafts for toddlers are all great ways to create while you learn. And, if you love doing crafts with your toddlers, check out all of our fun and Simple Crafts for Toddlers here. The crafts are easy and emphasize process over product. 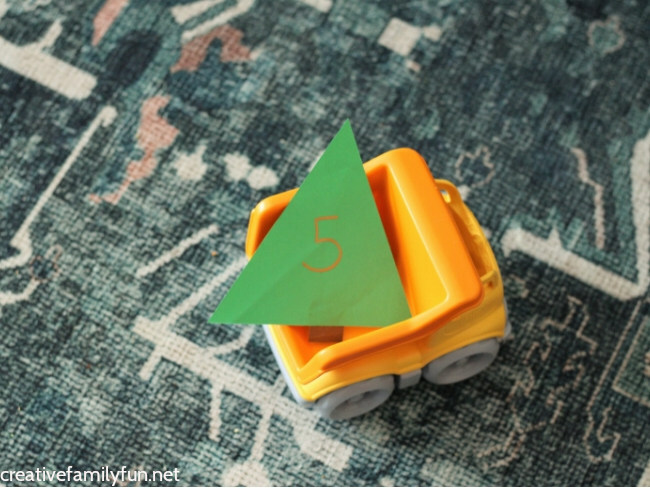 They’re all a fun way to help your toddlers get familiar with simple shapes. Learn about circles, squares, and triangles with these fun crafts. Make fun collages using shapes with our fun Shape Collage craft. Turn a square into a fun monster with our simple Square Monster craft. Use a fun stamping process to make this fun Circle Art from Teaching 2’s and 3’s. Create circles of many sizes with this fun Circle Process Art activities from What Can You Do With Paper and Glue? 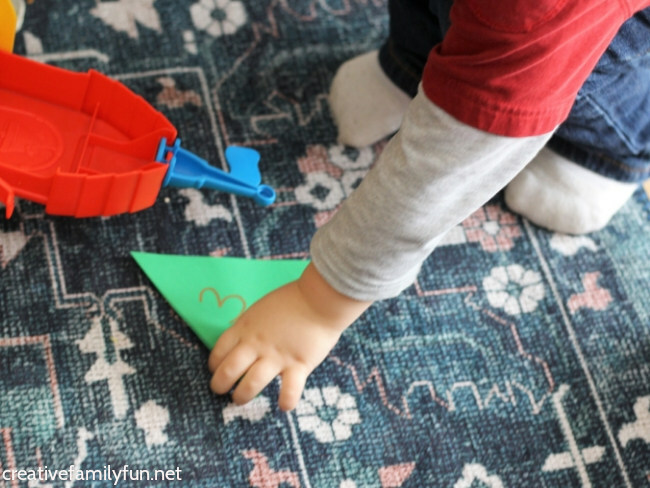 Learn about triangles with this fun Sponge Stamped Triangle Collage from Buggy and Buddy. Use glue and Fruit Loops for this simple Circle Craft from Everyday Chaos and Calm. Create a fall tree out of triangles with this fun craft from Coffee Cups and Crayons. Get creative with some big artwork with this Easy Shape Art from Meri Cherry. 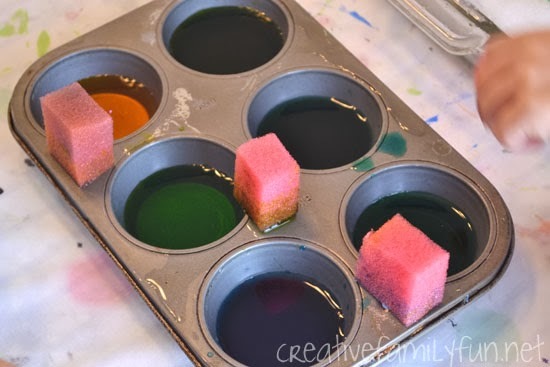 Make pretty art with squares with this Square Painting project from Teaching 2’s and 3’s. 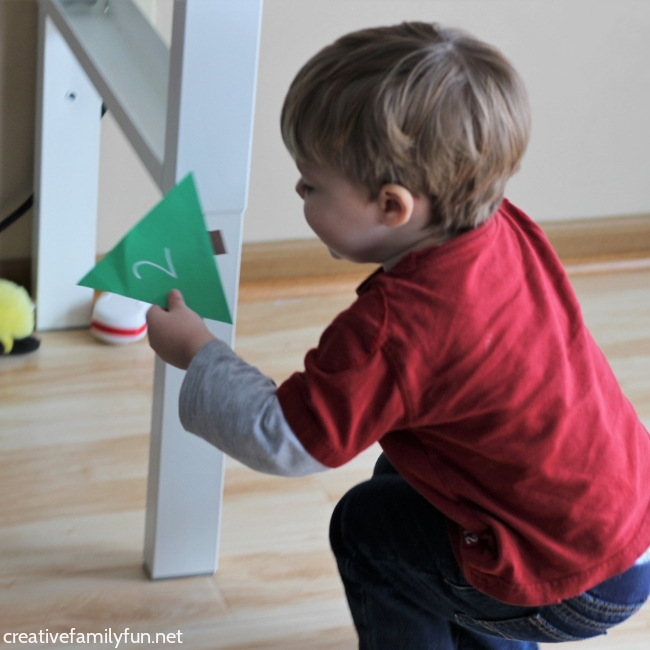 Paint shapes with this easy toddler painting idea from My Bored Toddler. Practice sorting while you make pretty suncatchers with this Shape Sorting Suncatcher craft from Happy Tot Shelf. Make beautiful paintings with this fun Contact Paper Resist Shape Art from Mess for Less. 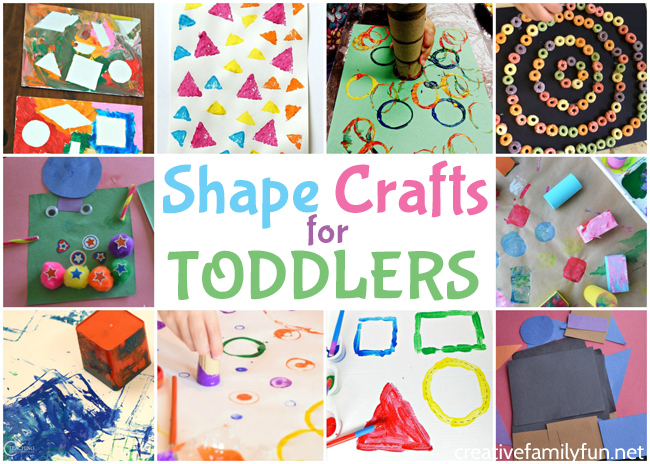 Which of these fun shape crafts for toddlers are you going to try? Do more with your toddler! I’m always looking for ways to get kids moving and learning especially in winter when we’re stuck inside more. 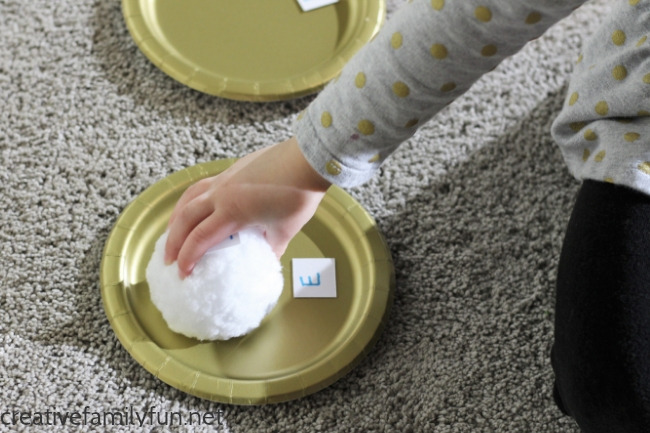 Let’s practice letter recognition and letter sounds with a pretend snowball fight. 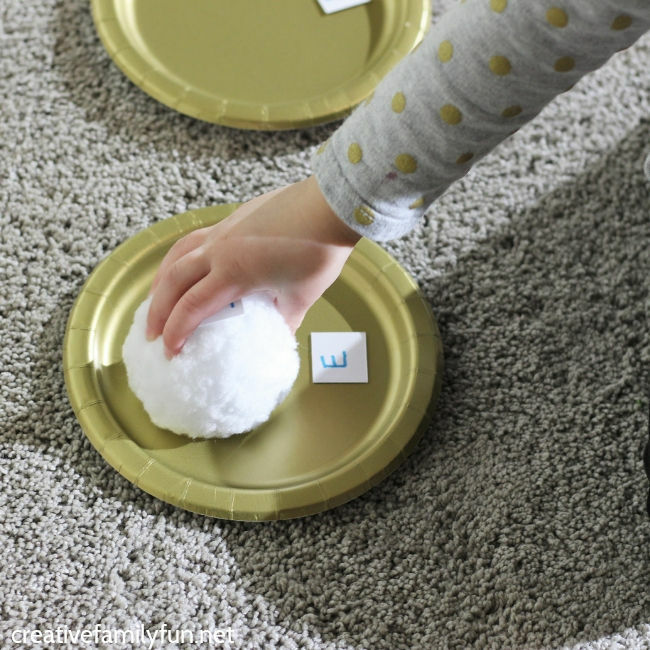 Toddlers and preschoolers will love this snowball toss alphabet game. And, once you’re done playing you can move on to more fun activities for toddlers. 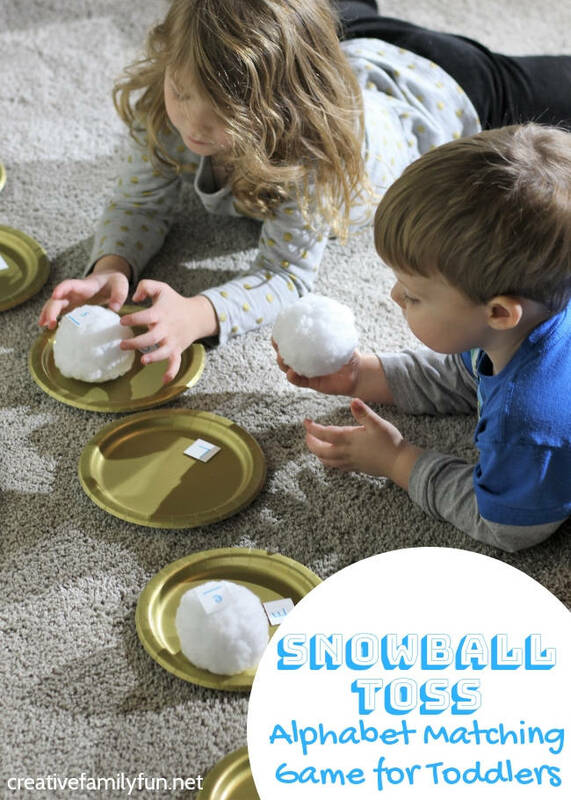 I found 10 indoor snowballs for $3 at the Target dollar spot. Walmart is selling 20 indoor snowballs for about $10. You can also get indoor snowballs on Amazon. You could even make your own snowballs from balled up socks or crumpled paper. The indoor snowballs remind me of giant pom poms, but they are weirdly squishy. You know how real snow feels when you make a snowball – that squishy, crunchy feeling? The indoor snowballs replicate that feeling. I used a paper cutter to cut a piece of white card stock into 1-inch squares. Then, I wrote a letter on each paper square. I drew a line at the bottom of each lowercase letter and some of the uppercase letters just so it was easy to tell which direction the card went. I used uppercase and lowercase letters for our matching game. 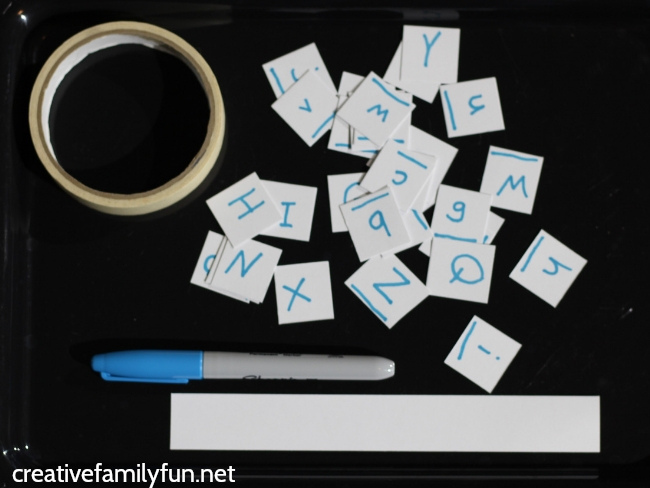 You could play the matching game with the same case to work more on introducing letters. 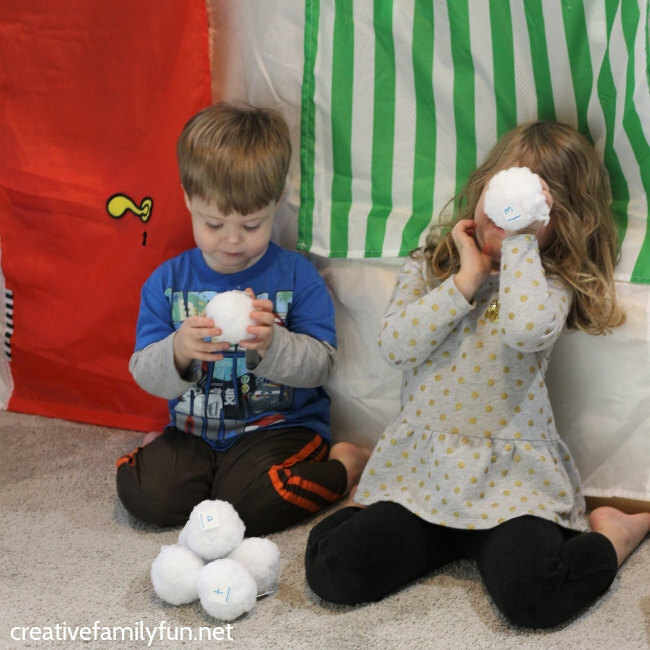 Tape one lowercase letter to each snowball. Now you’ll need a landing zone for the snowballs. I used small paper plates. You could use containers or even pieces of paper. Tape one uppercase letter to each landing zone. Place the uppercase letters on one side of the room. We lined the paper plates up near the wall. 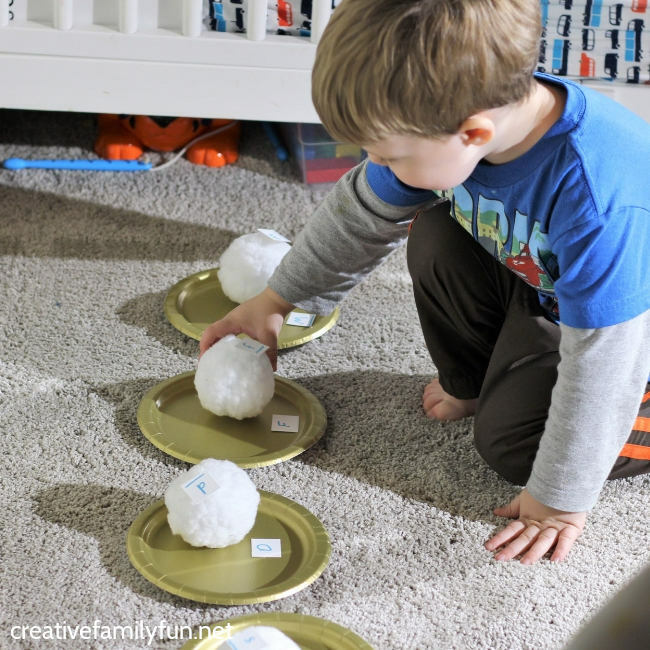 Make a pile of snowballs on the other side of the room. 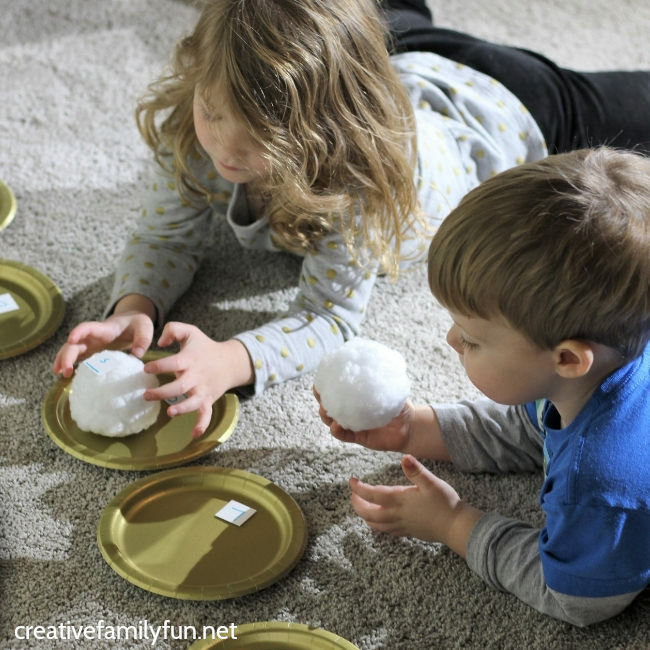 Now have your child throw the snowball across the room (towards the paper plates). I had my kids throw the snowballs at the wall. 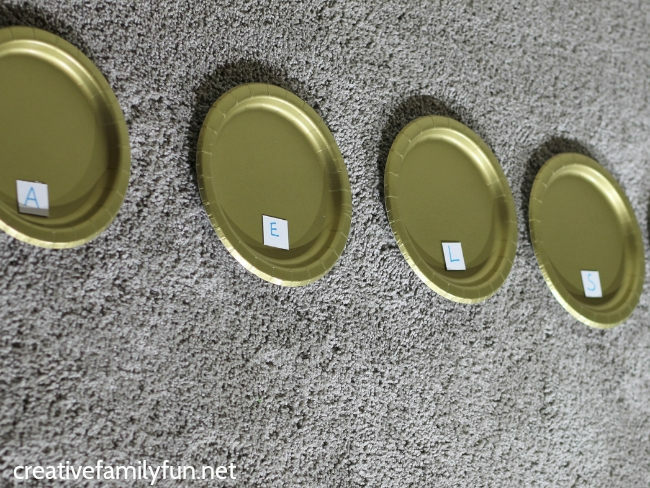 Next, have your child pick up the snowball and find it’s matching letter on a paper plate. Say: “You have the little (lowercase) letter e. Can you find the big (uppercase) letter E?” Have her place the snowball on the correct letter. Keep throwing snowballs and matching letters until you run out. 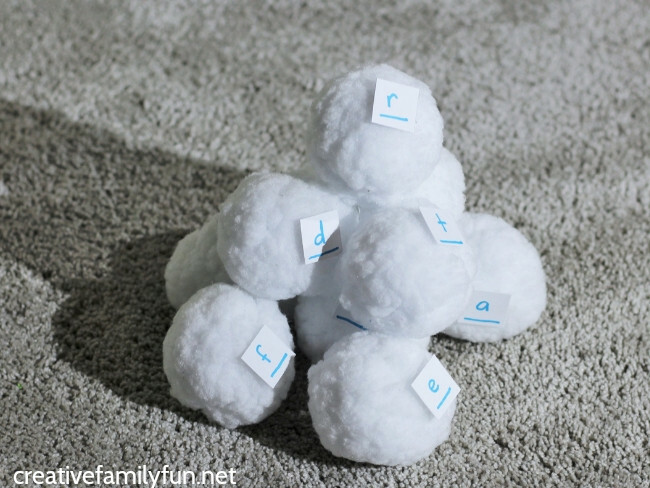 My toddler (age 2.5) and my preschooler (age 4.5) equally enjoyed this snowball toss alphabet game. They loved getting to throw the snowballs at the wall and then had fun finding the right letter. Sometimes my toddler read the letters upside down and just made a match with whatever he thought the letter was. I had to have him slow down a bit and help him double check the letters. I love how this game gets kids moving and working on gross motor skills (throwing, bending, running, etc.) while practicing the alphabet. 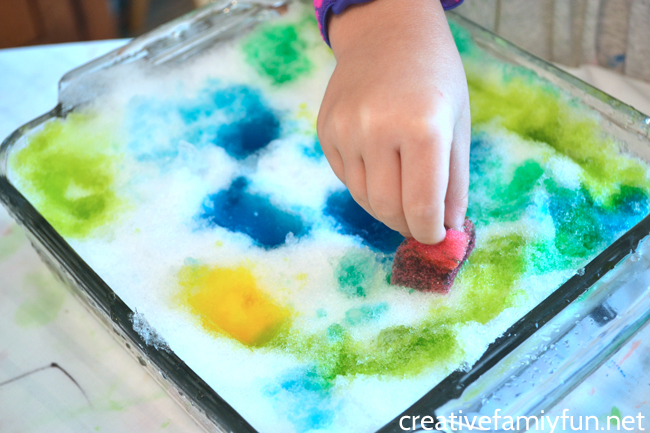 Set up a snow sensory bin for small world play. Use snow as a canvas for some Snow Painting. 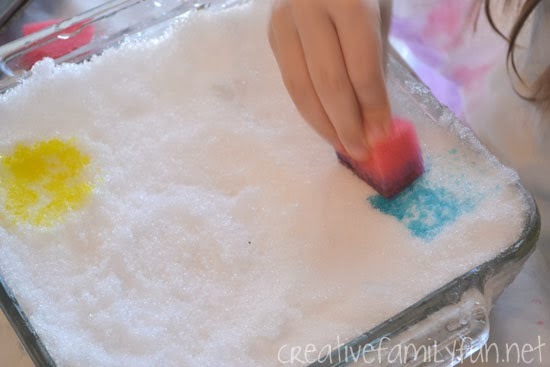 Make a fizzy snow dough sensory bin. Try some penguin painting, an easy art project that’s perfect for toddlers. 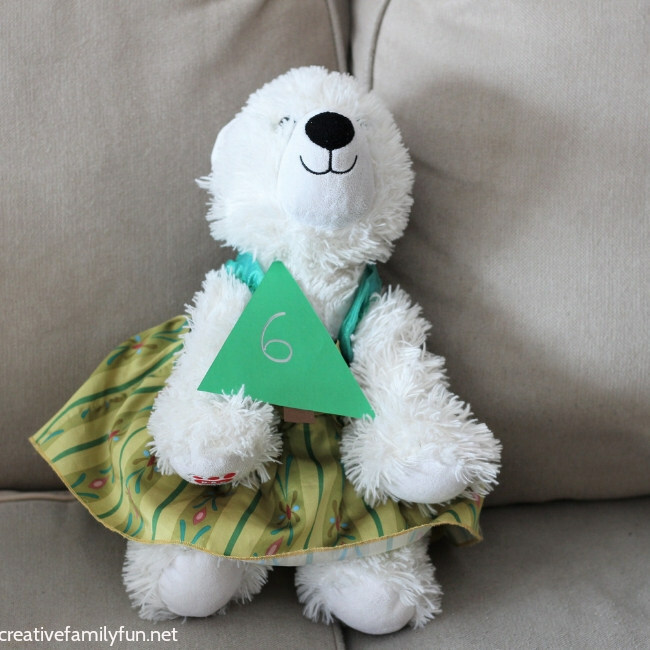 Go on a festive Christmas themed hunt for numbers. 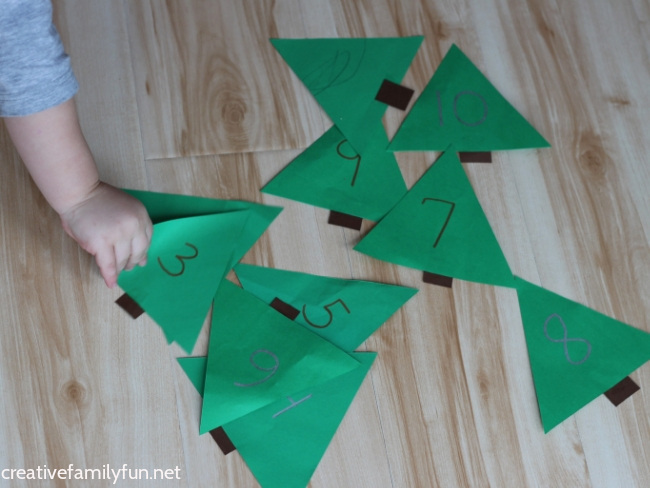 Toddlers will love this Christmas tree number hunt. It’s perfect for practicing number recognition. 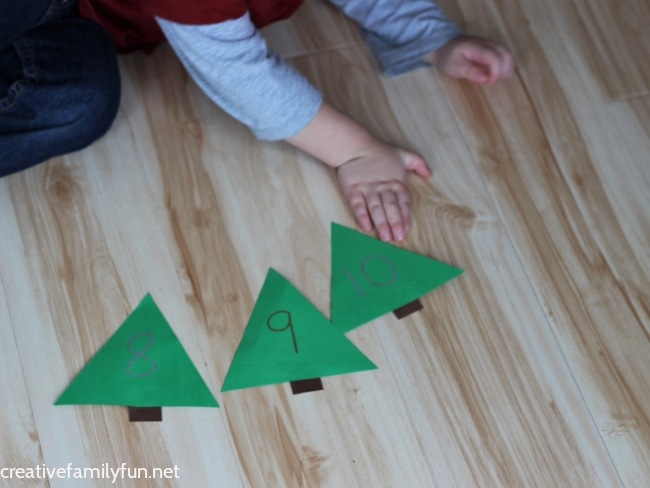 Or put the Christmas trees in order to make a number line. 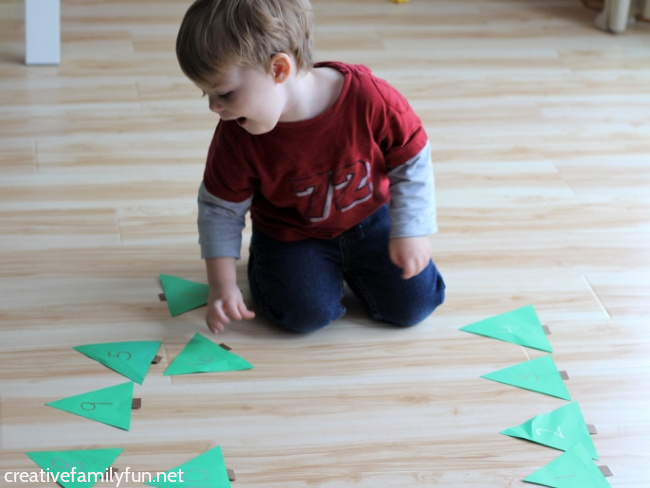 And when you’re done counting, check out all our other simple and fun activities for toddlers. 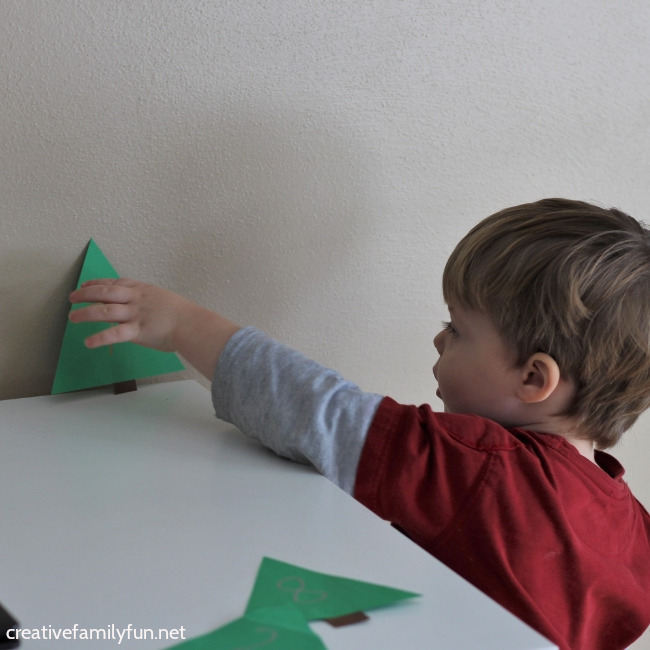 You’ll need green and brown paper, glue, and markers to make the Christmas trees for this activity. You could also laminate the trees using contact paper or laminating sheets. Cut Christmas trees out of green paper. I used a simple triangle shape. Add a trunk to your trees using rectangles of brown paper and glue. 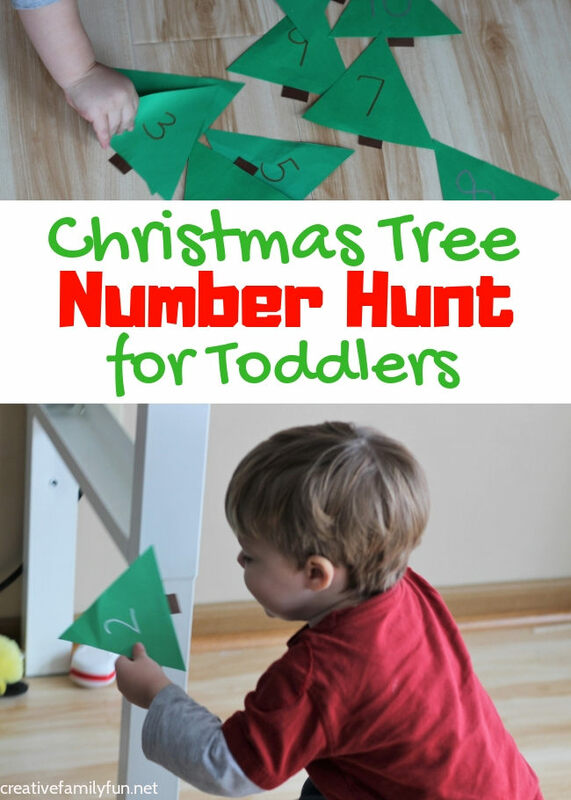 Use markers, to write a number on each of the Christmas trees. We used the numbers 1-10. Hide the Christmas trees around the room. For toddlers, it’s a good idea to hide them in plain sight. You can vary the height of your hiding locations or slightly hide the trees under something. If your toddler is struggling with finding a Christmas tree, give him a clue. Say: look near the couch, or can you find the number by the window? 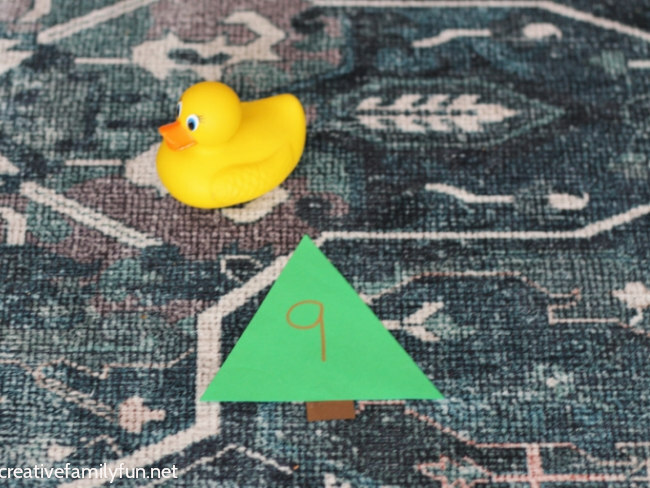 When your toddler finds a Christmas tree number, ask him what number it is. If he doesn’t know the number, say it and have him repeat the number after you. Place the Christmas tree off to the side. Keep hunting for numbers and saying their names. Once you have found all of the numbers, it’s time to sort them. Ask your toddler to find a number one at a time. Start with 1 and work your way to 10. Place the numbers in a line. Once your Christmas tree number line is complete, point to each tree and say the numbers together. Hide the trees and go on a Christmas tree number hunt all over again. My kids like to take turns hiding the trees for each other. If they hide the trees really well, they have to give clues. 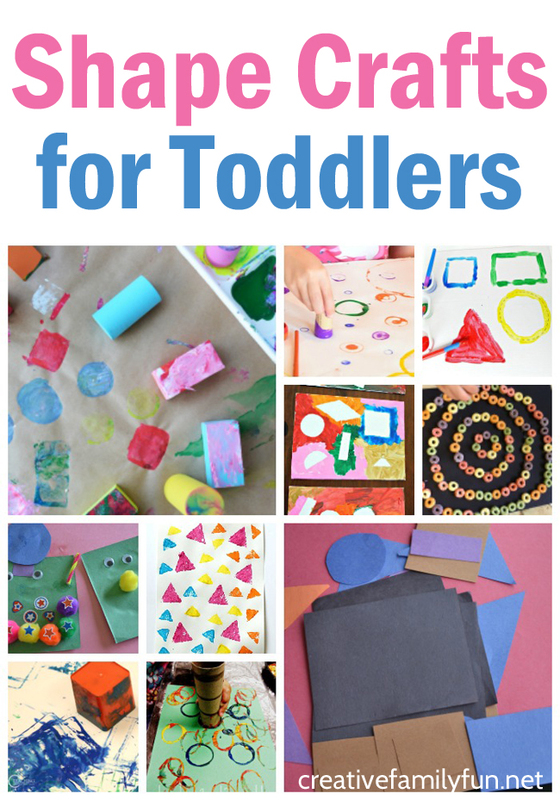 Do more activities for toddlers!